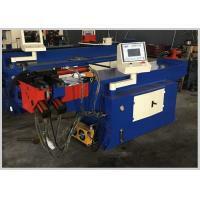 The traditional two-dimensional bending machine has been unable to meet the needs of modern and complex industries. 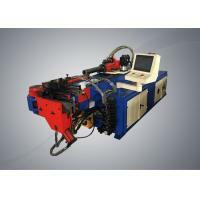 The three-dimensional pipe bending machine is gradually developed in this context. 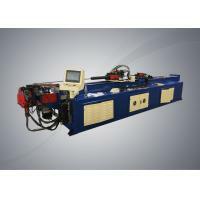 The application of programmable design controller in the bending machine control system provides technical assurance for the complex bending pipe system. 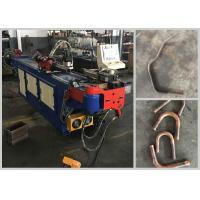 Our pipe bending machine is very convenient to use, and can be quickly and skillfully used. It can be operated without deliberate training. 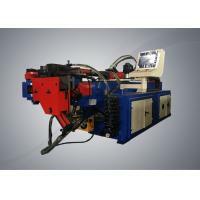 It can carry out three-dimensional three-dimensional bending pipe processing methods. 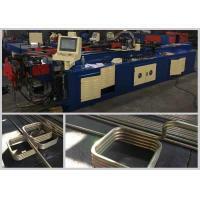 Only the input of the coordinate size can realize the simulation of bending pipe processing. 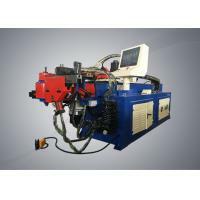 For a variety of complex pipe bending operations, our pipe bending machine can easily and quickly change the processing mode, can perform memory editing, make the processed data archived so that it can be used directly next time, with high-speed operating efficiency. 1. PLC control and the machine runs steadily. 2. It has various functions can be chosen, such as manual operation, automatic, semi-circulation, full-circulation and others. 3. Two angle setting, 0° to 185° is chosen at will. It can choose an angle or two angles continuously. 4. Mobile type foot switch with three functions, auto start, emergency stop, going on after emergency stop. 5. The safety is high. 6. 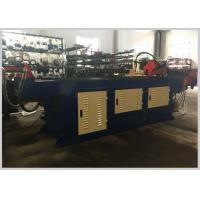 Large volume cooling circulation system to make the machine run more steadily. Plunge the elbow in a clockwise direction and cap it. Replace the required elbow wheel die and tighten the cap. 2. 1.Loosen the clamping bolts and press the manual “Pinch” button until the clamped mold reaches the end point (there is a gap between the bending tube mold and the clamping mold). 2. 2.Adjust the clamping mold seat adjustment screw so that the clamping mold and the bending tube mold are fully compressed. 2. 3.Press the “Retreat” button to retract the clamping mold, and then turn the clamping mold adjustment screw into about 1/4-1/2 turns. 2. 4.Lock the clamping block fixing bolt. 4. 1.Screw the mandrel onto the mandrel screw and fix the mandrel to the proper position to fix the nut. 4. 2.Relax the mandrel cylinder bolts. 4. 3.The pointer of the moving mandrel cylinder block is related to the scale of the rail holder and the radius of the elbow. 4. 4.Lock the mandrel and cylinder. The wrinkle-resistance mold is mounted on the wrinkle-proof plate seat, and it can be properly adjusted as shown in the figure by 1° to 2°. 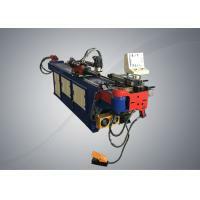 The bend angle control is controlled by a proximity switch, a scale display is shown at the adjustment position of the proximity switch, and the proximity switch adjustment block is adjusted to a desired angle. 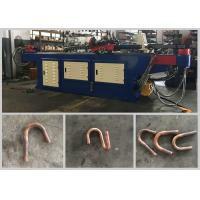 Above is the first angle, below is the second angle, corresponding to the angle/double angle selection on the operation panel, after the trial bend and then trim the angle. 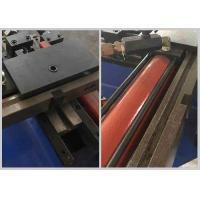 Because the material of the pipe is different, the rebound amount is also different. After the adjustment is completed, the locking screw lock nut on the nut will be adjusted. Press any of the manual buttons of pinch tube, back clamp, core, and back core to release the pressure displayed on the pressure gauge. At this time, rotate the pressure relief handle of the overflow valve to adjust the pressure to the desired pressure of 10 MPA. The bending resistance should not be too high, so as not to increase the oil temperature and to accelerate the wear of hydraulic components. Recommended application industry: automobile fittings, oil pipe for brake, muffler, seats, motorcycle fittings, healthy equipment, air-conditioning, bicycle, steel furniture, sanitary wares, automobile fittings, brake lever, silencer, seats, motorcycle, body-building equipment, air conditioner, bicycle, steel-made furniture, sanitation equipment and other manufacturing trades. Adapted material: steel pipe, stainless steel, copper pipe, aluminum pipe; rectangle pipe, square pipe, round pipe, round bar, square bar.